The first and only Backpackers in Mombasa has been open for over a year, pleasing the needs of Backpackers, and still going strong. 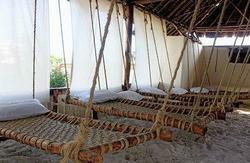 All beds come with mosquito nets and all rooms have fans. We are located in a suburb north of Mombasa called Nyali, far away from chaotic city centre, that way you can't smell it nor hear it, but still within easy reach (15min by public transport) Described as having the best location in the whole of Mombasa. We are second row from beach so we have lots of sea breeze. We are a mere 4 solid minute walk to the beach and 5 minute walk to the biggest Nakumatt in Town and to Malindi Road which has a wide range of options of public transport. - DSTV Cable/USB compatible/Plasma TV- in a lounge room full of couches, and mattresses on the floor with pillows everywhere for you to relax while watching your movie. - A second plasma TV with DSTV cable at the BAR only for sports (TV volume will be on mute at all times expect on special matches, music will still be on at all times in order not to kill the bar atmosphere. But feel free to let us know if there is a particular game you wish to watch while staying with us. Let it be cricket, rugby, surfing, football, etc). - A well stocked BAR, no other bar in the whole of Kenya offers the number of beer selection we have, over 23 local/imported brands. Plus a jack for you to plug in your ipod and share your music with us. - Massive BBQ most Fridays. - We are friends with the best water sport centers/Backpackers in East Africa offering sweet deals to our clients. - Free trial pool scuba dives done by the only 5 star PADI in East Africa, Buccaneer Diving, in the Backpackers swimming pool and 10% DISCOUNT if you dive with them. - Drinking games and board games on sight. - Info on spots to kite-surf and scuba dive on the whole Kenyan Coast. - Well up-to-date info about travelling/backpacking in the region (where to go, places to stay and how to get there - ask for David). - Storage room (to drop most of your stuff and travel light while your crossing/vagabondage/kite surfing the Kenyan coast). Importan Notice: We have relocated on June 2011 within Nyali. From Moyne Drive #689 to a better, more centric location, on Mwamba Drive #69. *All prices are inclusive of 16% VAT, and 2% Training Levy. Free tea and coffee until noon, free access to the fastest WIFI of any backpackers in East Africa. We are located on Mwamba Drive, house with a black gate #69 (right before the 'Sunrise Resort Apartments'. Off Links road ). by the Kenol Petrol Station on the Mtwapa Rd. right behind Nakumatt City Mall in a suburb north of Mombasa called Nyali, far away from chaotic city centre, that way you can't smell it nor hear it, but still within easy reach (15min by public transport). 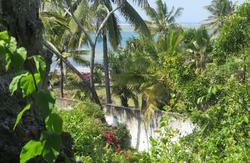 Described as having the best location in the whole of Mombasa. We are second row from beach so we have lots of sea breeze. We are a mere 4 solid minute walk to the beach and 5 minute walk to the biggest Nakumatt in Town/ Malindi Road which has a wide range of options of public transport. As well as many shops and restaurants near by.